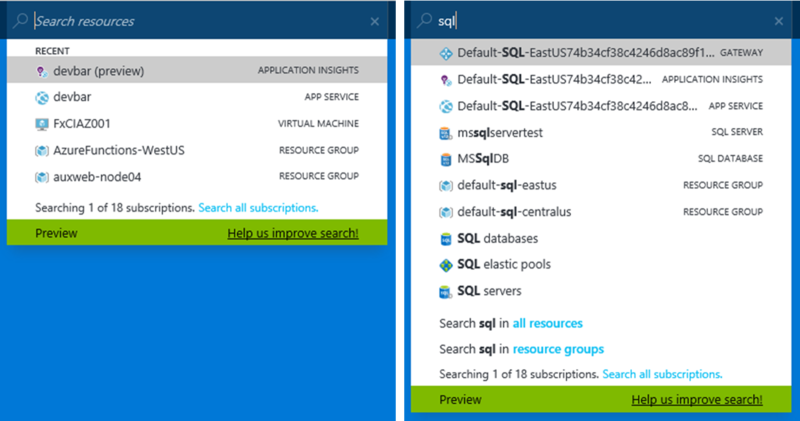 Search in the Azure portal just got better. You can jump to your resources, resource groups, and subscriptions no matter what you have open by using the global search box in the top bar. Click in the search box (or use the "/" keyboard shortcut), and you'll get a list of the last few resources you've used in the portal. Type a few characters of the name of what you're looking for, and you'll get a list of the resources, resource groups, and subscriptions that match your query. If you search for a type of resource, like "virtual machines" or "SQL databases," you can jump directly to the list of those resources—anything in the Browse menu on the left. We're just getting started with search, so please send us feedback!